Using mBox® – microarray handling without removing slides! Immerse 20 slides in liquid during blocking, denaturating, and post-arraying. It separates and prevents slide damage during shipping and processing. Optimally designed rack spacing for easy slide removal. 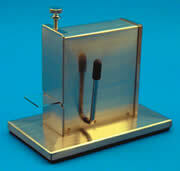 Fits standard microtiter plate formats for centrifuging. Manufactured to prevent slide contamination. A convenient removable handle available. 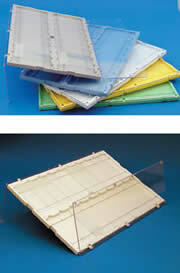 The inclined acrylic slide rack is used for draining and drying microscope slides. It accomodates 50 microscope slides in 10 slots. Dimensions are 8.2W x 8.5D x 2.0H (front) x 4.45H (rear). Molded of attractive gray ABA plastic. 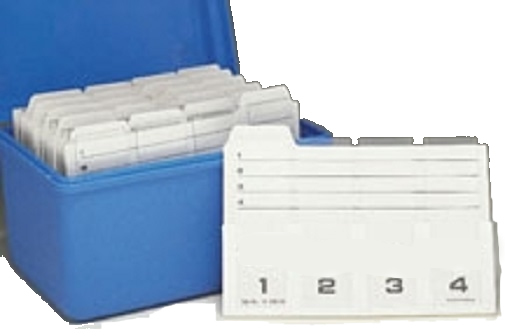 This dispenser provides a method of releasing clean, dust free 1"x3" slides, one at a time. Comes with a clear molded plastic cover to allow for visual checking of unused slides. Measurements: 4⅜" x 4⅞" x 5½". Made from stainless steel and has suction cup feet to keep the unit in place. A universal slide holder that is ideal for drying slides (or drying and organizing slides) during frozen sectioning or routine processing. Made of durable polyethylene, with 12 slide slots designed to hold slides vertically or horizontally. Hold slides during evaluation, cleaning, and drying. Made from solid high density polypropylene blocks with 13 slanted channels (on a 10o angle), 1/16"(1.5mm) (W) x ⅜" (9mm) (D). It is made to hold 3 x 1" (75 x 25mm) slides during cleaning, draining excess immersion oil, and even drying. They are white in color and are chemically resistant. Available in 40 or 90 capacity (vertically held). Made from rigid polystyrene, with a removable lid. 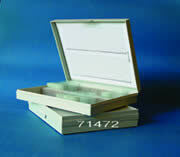 This 25 capacity slide box measures only 3 5/8"(92mm)(L) x 3 1/4"(83mm)(W) x 1 1/4"(32mm) (H). The box is available in either white, red, or blue. 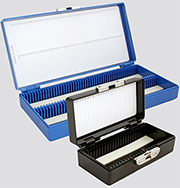 For the orderly visual display and safe transport of microscope slides. 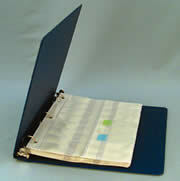 This loose-leaf binder has ten vinyl View-Packª pages (hold 160 slides). Each page holds 16 slides 3x1" (75x25mm) in individual pockets with a white back and clear front. A flap in the center keeps slides from falling out. Simply fold the page at the center crease to retrieve slides. The 8½" x 10½" (22x27cm) View-Pack pages comes with a standard 9"x12" (23x30cm) 3-ring binder. Molded one-piece polypropylene construction with an integral living hinge. Numbering in the base corresponds to the printed index in the covers for slide identification purpose. Boxes are designed to be stackable to save space. The tensioned clasp insures a secure closure. Available in 25 or 100 capacity. Fits 1 x 3" microscope slides. PLEASE NOTE: For file up to 1,200 1x3" slides, refer to File Cabinet Systems and Portable Storage Chests. Made from durable polystyrene (with heavy walls). This material is unaffected by humidity and is thoroughly insect proof. Each box is secured with a rust-resistant nickel-plated clasp and hinge pin. The cork lining prevents damage to the stored slides. To ensure proper slide identification, each slot is numbered to correspond to the slide inventory sheet on the inside cover of the box. To save space the boxes are stackable. 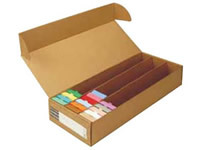 Each box stores up to 100 3x1" or 25x75mm microscope slides. 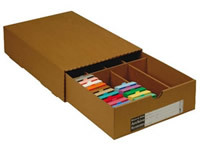 available in 5 color coded boxes making the boxes easy to identify. Each box measures 8.75" x 6.75" x 3.375" (222x172x85mm). Molded from blue high-impact styrene, the Carolina blue Box is manufactured to our exacting specifications. Compared to conventional wooden boxes, the Carolina Blue Box is smaller in size, lighter in weight, and held to closer dimensional tolerances. The 75x25mm (3x1") slides fit the slots and will not slip out once in place. A shoulder on each box excludes dust and identities the top of the box. The boxes are available in two sizes: 3 1/4" x 4 1/4" x 1 3/16" (for 12 slides). 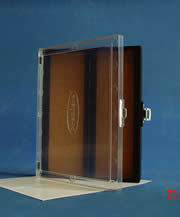 These slideboxes feature a slide rail design that ensures a secure fit with easy placement and removal of slides. Centrally positioned location numbering grid enables simple slide organization with easy viewing of location numbers. 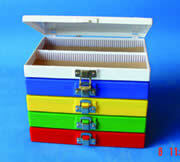 They are made from ABS and Polypropylene, which makes the boxes robust and eliminates potential rusting of metal parts. Hinged lid smoothly opens 180° sitting flat on surfaces and prevents misplacement. The slide lock has easily identified lock and unlock symbols and provides secure storage. A 2 mm zip tie can be used for more secure storage, if desired. Same construction as (#71470), but with a slip-on cover; gray in color. 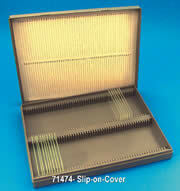 Same construction as (#71470), but with a slip on cover; stackable and gray in color. 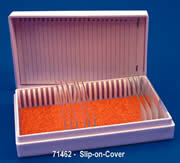 Same characteristics as (#71470), but with a slip-on cover; Holds 25 1x3" slides. ¼"(H) x 3½"(W) x 5½"(L). These storage boxes are available in two sizes. Durable, wood frame, covered with heavy black embossed paper. The hinges and latches are Nickel plated. A numbered plastic insert provides spacing for the handling of the slides. The box accommodates 100 of 3x2" slides. The box measures 9¾" (L) x 2¼" (H) (24.7x19.7x5.7cm). Made from wood with numbered partitions which correspond to the index card. Very durable and has a detachable lid. The box accommodates 25 of 3x2" slides. Specially designed for the 3 x 2 slides. This reinforced ABS material is rugged and designed to store and transport slides. Store in ultra-low temperatures with confidence. 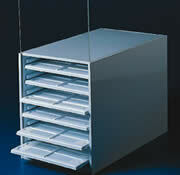 Stainless steel racks can accommodate various sizes and styles of storage boxes. Rack features high-durability, corrosion-resistant stainless steel material and handles for easy removal. Designed to fit most freezer models and makes. Low-cost choice with excellent low-temperature storage properties. 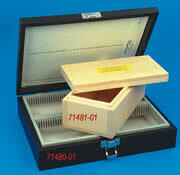 One-size box safely stores 15 and 50 ml tubes in LN2 or mechanical freezers. The Slide Box is available with either a cork or foam backing and features a secure lock to ensure it does not open accidently. This 100-Slide Storage box has a clear lid enabling lab personnel to read the contents listed on the enclosed index without opening the box. Made of Black ABS plastic with metal clasp hinge and cork lining. Numbered slots correspond to the paper index. Stackable. 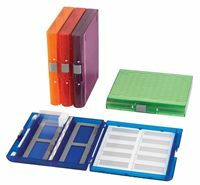 Molded from one piece (lid and bottom) polypropylene these slide boxes are able to accommodate either 25 or 100 standard 3x1" (75x25mm) slides. The attached lid is held securely by a closed latch lock. Stacking feet maximize the stability when boxes are stacked up one atop the other. The boxes are unlined and the index number is printed on the bottom. Comes complete with a numbered slide index card. These boxes are available in blue, red or white. Holds 20 or 30 of 1x3" slides in a numbered compartment. The compartments are recessed so the specimen cannot be touched when the cover is closed. White, thermo-formed Polystyrene. Holds 20 of 1"x3" standard slides in a horizontal position. A white background makes it easy to distinguish dyes and stains. The tray features a thumb cut to simplify the removal of slides. The outside is made of white polypropylene, the tray rails are polystyrene, and the vertical sliding door is clear acrylic; this 240-slide capacity cabinet holds twelve microscope slide trays (#71500) horizontally, and it is dust free. Measurements: 7¾"x14"x7½"high (17x36x16cm). 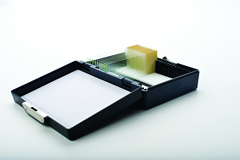 This durable, ABS hard plastic slide tray will hold up to 20 standard microscope slides 75 x 25 mm (3x1"). 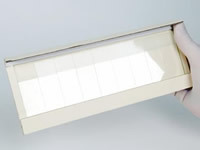 Ivory color consists of two rows, each with securely holds 10 slides. Each numbered cavity has thumb cut and raise notches for easy to remove the slide. Stackable. 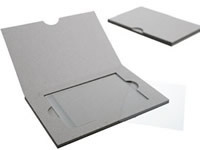 The Slide Folder™ will hold up to twenty standard microscope slides 75 x 25mm (3x1") and is made of two parts: a base holding the slides horizontally offering numbered space for easy identification, and transparent doors which can either cover the slides or be swung behind the SlideFolder™ for space conservation while using the tray. The base is available in 5 different colors, offering color-coding for each job. Each slide location is identified with a number from 1 to 20. Removal of the slides is made easy by simply pressing on one end, which will lift the other end up. The two transparent hinged covers offer a full view of each stored slide, even bar codes can be read without removing of the slide. All units are stackable and will resist temperatures between -80°C and +100°C. They are not autoclavable.